Choose from a large selection of beautiful and elegant wedding invitationsto match the style of your wedding ceremony! The invitation is so important to present the wedding date in a beautiful way to your invited guests. When planning a wedding one of the most important items is the type of invitation to send. Wedding invitations should reflect the style of the wedding ceremony and we have hundreds of invitation styles to match any personality style. Weddings Are Fun carries beautiful wedding invitations, save-the-date cards and magnets.. 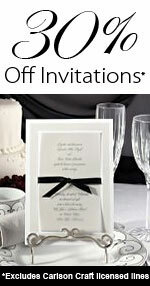 INVITATIONS - Save 30% off beautiful and elegant wedding invitations from Carlson Craft and Birchcraft! ACCESSORIES - Save 20% off accessories from Carlson Craft and Birchcraft. Also save 20% off napkins from Carlson Craft and Birchcraft.